Hello everyone, my name is Matan Kramer, this year is my Barmitzvah and I want to do something special and out-the-box to make a difference for my country Israel and the Jewish people! So, I thought together with my parents about a few ideas and I came up with the idea of doing something to help other people. We explored a number of different charities in Israel and then I chose one which really inspired me the most. Today United Hatzalah is one of the most unique organizations that save thousands of peoples lives everyday in 3 minutes or less and most amazing of all its free of charge for all those that are helped! We went to United Hatzalah’s headquarters in Jerusalem and saw first-hand what the organization does. We watched some amazing videos, some of which you can see on this page, of how they train almost 5,000 volunteers around the country that respond to emergency calls at any given moment throughout the day. They use a special technology called NowForce which identifies and contacts the 5 nearest responders to an emergency and then communicates with the responder and person-in-need so that every call is responded to within under 3 minutes. I also learned the story of United Hatzalah’s founder Eli Beer, who started the organization because he saw how long it used to take regular ambulances to arrive at the scene of emergencies. For years people thought Eli was crazy even his own family and eventually Eli landed up saving his fathers life because when he had a heart-attack, the first responder was from United Hatzalah, and it was even an Arab-Israeli responder, since Eli had recently started a branch of United Hatzalah in East Jerusalem to serve the cities Arab residents. 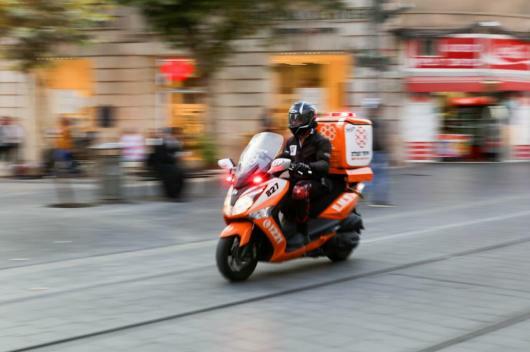 For my Barmitzvah I wanted to donate an Ambucycle to United Hatzalah, which is an motorcycle packed with all the equipment that a mini-ambulance would require. This enables the responder to reach the scene of an emergency quicker and stabilize the patient until the ambulance arrives and takes them to the hospital. So far, these motorcycles have helped more than 3 and a half million people, of which 10% of those were life-saving incidences. I realized that I would not be able to do this by myself only and therefore I am asking you to join me and help make this dream come true! There are different ways that you can help and whoever helps will receive an amazing T-shirt that I designed for United Hatzalah. I can’t wait to stand at my Barmitzvah B’’H in June and see what we have all accomplished together! !